There were instructions scribbled on a note for me. Kell said to take some chicken breast and “burger” it to enjoy with the sauce. I like her verbage. Burger it. So I did! I butterflied a couple of chicken breasts so they were of even thickness and cut pieces that were burger-sized. 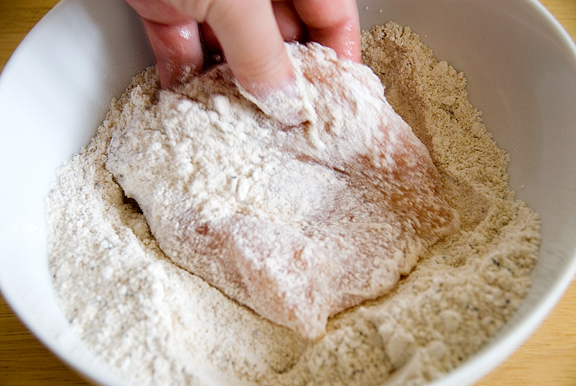 First I dipped the chicken in frothy egg white and then dredged each piece in a mixture of flour, garlic powder, ground pepper, salt, and bread crumbs. 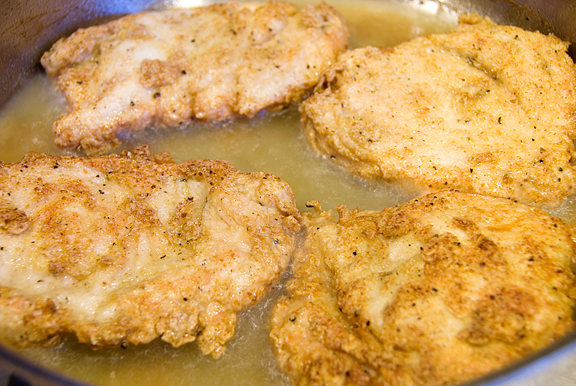 Next I fried them up in oil – a process that makes every southern girl salivate, even in polite company. 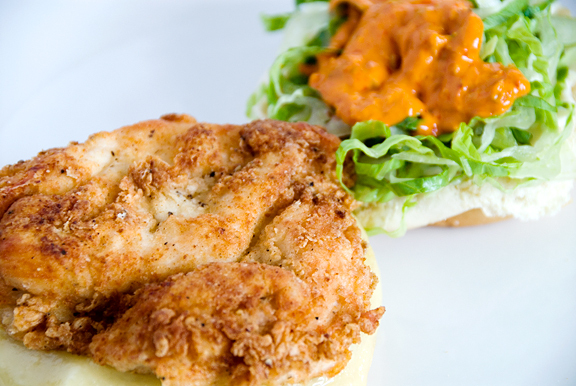 Once the burgered chicken filets are ready, slap them on some soft bread (toasted or no – we go for both teams in this house) with shredded lettuce, a swipe of mayo, and most of all the Oporto sauce. What is in the sauce? I haven’t tried replicating it myself, but the ingredients listed on the packet are as follows: chilli purée, vegetable oil, water, ginger, lemon, garlic, salt, thickener, vegetable gum, preservative. I don’t have vegetable gum or preservative in my kitchen, but I dare say I might give it a go. Damn good sandwich, I tell you. Gives my Chick-fil-A a run for her money. Love the spicy. This comes close to fast food lust. Is it awful that it’s 7.30am and I’m seriously craving one of these? Oh my god that looks good. Well I would have to skip the spicy stuff but I would be all over the chicken. Oh my, it does look just delicious! Man, I love fried chicken sandwiches. While traveling to VA for the holidays, I literally dragged Andrew to Chick-Fil-A at the first opportunity (in an airport). The thing that kills me is that he’s afraid of the classic sandwich and always gets the nasty chargrilled one … then stares with longing at the crispy perfection that I’m eating. Next time I don’t think I’ll let him order at all! I think Nando’s peri-peri chicken in South Africa would rate right up there… by the sound of it, it’s probably quite tastily like Oporto! I had a friend get me some Nando’s sauce last time she was in SA… but I just looked online, and you can order it here: http://www.nandosperiperi.com/categorypage.asp?affilid=1&curid=5 In case you’re interested, or anything! The chicken looks fabulous! I’ve never heard of using “burger” as a verb before. I’ll have to remember that. That chicken looks crispy, golden brown and good! Amy – I have to admit that it was terrific. peabody – the chicken is half of the magic! I’m all about the chicken!! Christine – ha ha, I believe it’s actually a Portuguese sauce, but anything with chili and ginger sounds good to me. Nic – that sandwich looks scary big to me! and is she wearing a wig or is her hair really dyed blue like that? *jealous* Tell Andrew to get with the program! He needs to have an original! kelley – wow! peri-peri sounds a lot like piri piri! 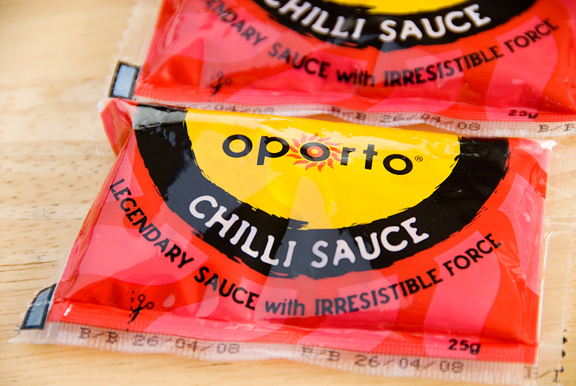 Nando may have some roots in common with the founder of Oporto (an immigrant from Portugal to Australia). Thanks for the link – looks GREAT. Kevin – it’s delish, man. You should try it. I stumbled your blog and found this recipe yummy!! Your food all looks so yummy! Thanks for sharing all these delightful little bits of heaven with us!